Israeli authorities discover Arabs stealing Jewish produce to sell for profit. Border Police detectives and South District police officers arrested three Palestinian Authority Arabs on suspicion of stealing hundreds of kilograms of agricultural produce from southern Israel. The investigation was opened after Border Police received information on three Palestinian Authority Arabs working in agriculture in the moshav (agricultural town) of Kokhav Michael near Ashkelon. The suspects regularly stole produce from fields near their workplace, building their stockpile during the week and selling their loot in the Palestinian Authority each weekend. Police officers following the suspects arrested them near the southern Bedouin town of Rahat. 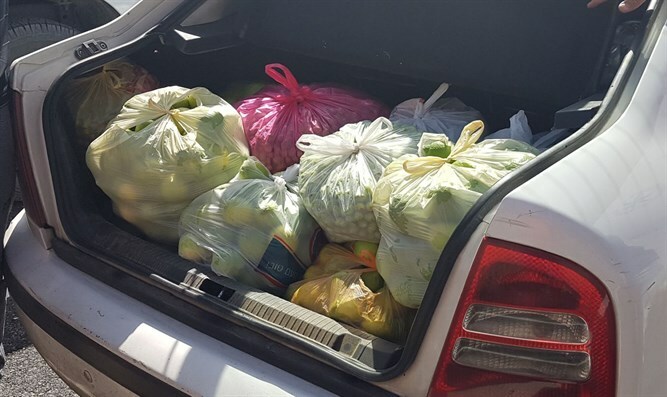 A search of the suspects' vehicle revealed 200 kilograms (441 lbs) of lemons and 100 kilograms (220 lbs) of olives. At the time of their arrest, the suspects were traveling to the Meitar Crossing near Beer Sheva. All three suspects are residents of the Palestinian Authority town of As-Samu located northeast of Meitar. Their driver, a resident of Rahat, was released upon completion of the interrogation. Border Police opened an investigation into the events, and an indictment is expected to be filed against three suspects, who will lose their Israeli work permits. In September, three Arabs from Jericho and the Negev village of Keseifa were arrested for stealing livestock. An additional three Arabs were arrested for stealing 250 kilograms (551 pounds) of grapes from a vineyard near Yatir, in southern Judea, in the hours prior to the start of Yom Kippur (the Day of Atonement). These Arabs attacked the security guard as well, threatening to further harm him if he called the police. Last week, 67 illegal Palestinian Arab infiltrators, residents of the Palestinian Authority - 40 minors and 27 adults - stole over 25 tons of grapes and tomatoes from Shekef, a moshav in central Israel.